​As the season enters its final straight, it's still all to play for in the Premier League and beyond, and as such, most managers are focusing on making the most of what they have until the window opens in June. That's not enough to stop the transfer rumour freight train in its tracks, however, and as outlets up and down the country have been churning out the speculation, we've thrown together some of Monday's highlights for your perusal. ​Chelsea, as we all know at this stage, are staring down the barrel of a two-window transfer ban, but Chelsea, as we all know at this stage, are pretending that isn't happening and pressing on with transfer plans nonetheless. Assuming their ​appeal ​later this week works in their favour, and they are granted the summer to stock up on new signings, ​The Mirror say they will move for Borussia Dortmund's teenage target-man Alexander Isak. The 19-year-old has torn the Eredivisie to shreds since moving on loan to Willem II in January, with 10 goals and three assists in his last six appearances, and the Blues are reported to see him as a long-term alternative to Alvaro Morata and Olivier Giroud. Conversely, there's also talk in there of a move for Robert Lewandowski, but we'll believe that when we see it. 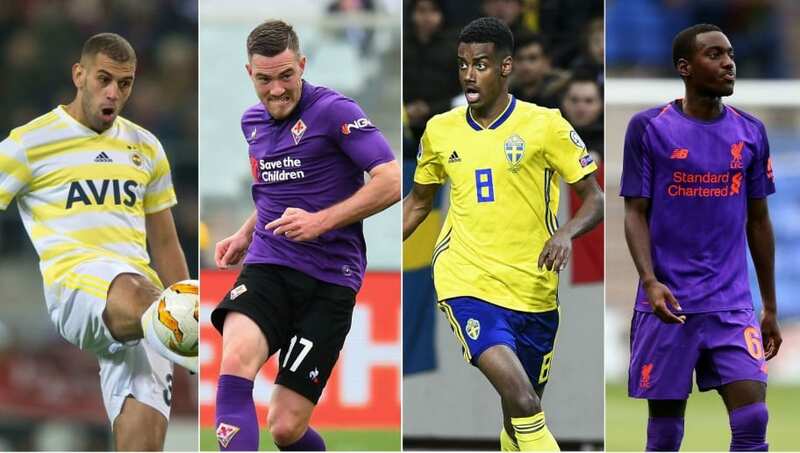 Losing Aaron Ramsey to Juventus in the summer will come as something of a hammer blow for ​Arsenal, so it comes as no surprise to see them being linked with a cavalcade of potential replacements. The latest midfielder linked with a move to join Unai Emery's revolution is former Aston Villa man Jordan Veretout, who has come into his own since moving to Fiorentina in 2017. According to Le Foot (via ​Sport Witness), the 26-year-old could be on his way back to England this summer, with Arsenal among a host of sides considering a bid in the region of €25-30m. That's because ​Goal say that Wolves, as well as Leipzig, Benfica, and Sporting Lisbon, are pursuing the 18-year-old's signature in the summer, with a minimum £10m fee touted for the Portugal youth international. He's currently pretty highly thought of by Jurgen Klopp and his staff at Anfield, and his versatility - capable of playing at right back or on either wing - could make him an important asset, wherever his long-term future lies. ​Barcelona have made no secret of their admiration for Dutch starlets as of late. The signing of Frenkie de Jong is already confirmed, and Matthijs de Ligt is ​rumoured to be following this summer, and ​RTV Noord report that they could complete the hattrick with a move for Gronigen's Ludovit Reis. An offer is 'expected' to come next week for the 18-year-old, who has made 25 appearances so far this season, and although no fee is mentioned, it isn't expected to be a bank-breaking deal on the level of either Ajax star. The report notes it should be the first time the two clubs have done business, though Luis Suarez, who featured for Gronigen before moving to Ajax, currently leads the line for Barca. The transfer saga surrounding ​Leicester City striker Islam Slimani rolls on to what seems like the 650th week, as reports have emerged in Turkey claiming his summer move to Sporting CP is still on - but only if an agreement can be reached over his wage demands. Slimani is currently on loan at Fenerbahce, where he has just scored once, and is thought to be out of favour at Leicester even since new manager Brendan Rodgers has taken over. The print edition of Takvim (via ​Sport Witness) claims that the Portuguese side still look like his most likely destination, but have told Leicester they cannot pay half of his wages, so it seems some compromise will be required before a deal can be finalised. 24-year-old Braga defender Bruno Viana has been linked with a move to both Leicester and Leeds, with ​TalkSport claiming both sides are interested in a move for the Brazilian, who has conceded just 28 goals in 28 Primeira Liga appearances this season. Brendan Rodgers is thought to be uncertain on who he sees at the heart of his defence going forward, with Harry Maguire continually linked with a summer move away, and both Jonny Evans and Wes Morgan getting on in years. In the case of Leeds, a move is expected should they gain promotion from the Championship, with a fee of £8-10m touted to secure his services.